ATLANTA (September 19, 2014) -- Chick-fil-A® founder and chairman emeritus, S. Truett Cathy, died at 1:35 a.m. Monday at the age of 93. He died peacefully at home, surrounded by loved ones. Born March 14, 1921, in Eatonton, Georgia, Cathy was four years old when his family moved to Atlanta, where he attended Boys High, now known as Grady High School. In 1946, Cathy relied on a keen business sense, a strong work ethic and a deep Christian faith to build a tiny diner in the Atlanta suburb of Hapeville, Georgia. He developed it into Chick-fil-A, which today has the highest same-store sales and is the nation’s largest quick-service chicken restaurant chain based on annual system-wide sales. It was at the original restaurant that Cathy created the sandwich that became the company’s signature item. Credited with creating the original Chick-fil-A Chicken Sandwich and pioneering in-mall fast food, Cathy built one of the nation’s largest family-owned companies, as Chick-fil-A reached $5 billion in annual sales in 2013. Currently, there are more than 1,800 Chick-fil-A restaurants operating in 40 states and Washington, D.C. Remarkably, Cathy led Chick-fil-A on an unparalleled record of 47 consecutive years of annual sales increases. 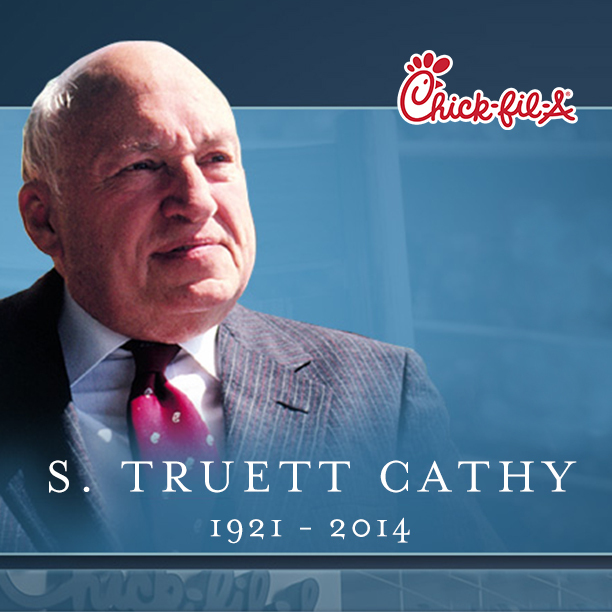 Cathy’s oldest son, Dan, became president of Chick-fil-A in 2001, and chairman and chief executive officer in 2013, while Truett Cathy continued in the role of chairman emeritus until his death. Cathy was a devout Southern Baptist who taught Sunday school to 13-year-old boys for more than 50 years. As an extension of the founder’s faith and the clearest example of incorporating biblical principles into the workplace, all Chick-fil-A restaurants—without exception—operate with a “Closed-on-Sunday” policy. Rare within the food service industry, this policy allows employees a day for family, worship, fellowship or rest, and also underscores Cathy’s desire to put principles and people ahead of profits. Chick-fil-A will remain privately held and closed on Sundays. Cathy’s business approach was largely driven by personal satisfaction and a sense of obligation to the community and its young people. His WinShape Foundation, founded in 1984, grew from his desire to "shape winners" by helping young people succeed in life through scholarships and other youth-support programs. In addition, through its Leadership Scholarship Program, the Chick-fil-A chain has given more than $32 million in financial assistance to Chick-fil-A restaurant employees since 1973. As part of Cathy’s WinShape Homes® program, 13 foster care homes were launched and operated by Cathy and the WinShape Foundation to provide long-term care for foster children within a positive family environment. WinShape Homes has provided a safe and secure home to more than 450 children in which they could grow physically, spiritually and emotionally. WinShape Camps® was founded in 1985 as a residential, two-week summer camp to impact young people through experiences that enhance their Christian faith, character and relationships. Each summer, more than 18,000 campers attend WinShape Camps. In 2003, Cathy helped his son and daughter-in-law, Bubba and Cindy, celebrate the opening of WinShape RetreatSM, a high-end retreat and conference facility located on the campus of Berry College in Rome, Georgia. The multi-use facility hosts marriage-enrichment retreats along with business and church-related conferences, and in summer months houses WinShape Camp for girls, directed by Cathy’s daughter, Trudy Cathy White. Cathy received countless awards over the years, including most recently becoming a Georgia Trustees Inductee (2013); Fayette County (Georgia) Chamber of Commerce Dreambuilder Award (2012); Children's Champion Hunger Award (2011); World Chamber of Commerce Lifetime Achievement Award (2010); Salute to Greatness Martin Luther King Jr. Award (2009); William E. Simon Prize for Philanthropic Leadership (2008); Paul M. Kuck Legacy Award (2008); President’s Call to Service Award (2008); the Cecil B. Day Ethics Award (2008); The Tom Landry Excellence of Character Award (2007); Greater Dallas FCA Lifetime Achievement Award from the National Poultry & Food Distributors Association (2005); Norman Vincent & Ruth Stafford Peale Humanitarian Award (2003); Catalyst Lifetime Achievement Award from Injoy/John Maxwell (2003); Georgia Sports Hall of Fame – Chairman’s Award (2003); Ernst & Young – Entrepreneur of the Year – Lifetime Achievement Award (2000); and Horatio Alger Award – Horatio Alger Association, Washington, D.C. (1989). Cathy was the author of It’s Easier to Succeed Than to Fail (Thomas Nelson Publishing, 1989); Eat Mor Chikin: Inspire More People (Looking Glass Books, 2002); It’s Better to Build Boys Than Mend Men (Looking Glass Books, 2004); How Did You Do It, Truett? (Looking Glass Books, 2007); and Wealth, Is It Worth It? (Looking Glass Books, 2011). He also was co-author of The Generosity Factor with Ken Blanchard (Zondervan Publishing, 2002). In addition to presiding over one of the most successful restaurant chains in America, Cathy was a dedicated husband, father and grandfather. He is survived by his wife of 65 years, Jeannette McNeil Cathy; sons Dan T. and Don “Bubba” Cathy; daughter Trudy Cathy White; 19 grandchildren and 18 great-grandchildren. Last week we published a story on The Chicken Wire, “You Might Be A Serious Chick-fil-A Fan If….” We included our favorite stories from some of our biggest fans: Chick-fil-A themed wedding cakes, Chick-fil-A food served at weddings, walking for miles (in the snow) just to get a chicken sandwich and sleeping outside of a Chick-fil-A grand opening.